July 10, 2014 – Why change what works? After all, when you’re looking to modify a show that has been in constant production for almost two decades (WaterWorld will be entering its nineteenth year of operation in 2014) well, you better have a compelling reason to do so. 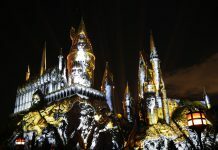 Indeed, after thousands of performances over the years, the folks at Action Horizons have done just that – bringing elements from Universal Studios Japan and Universal Studios Singapore’s installation of WaterWorld back home in Hollywood. Gone is Hollywood’s unique (and original) narrative, and in its place, a new altered plot that seeks to mimic its peers in Japan and Singapore. 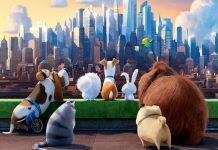 Furthermore, character roles have also been redefined alongside a handful of stunts that have been introduced in an effort to bring show elements closer to the audience’s point of view. 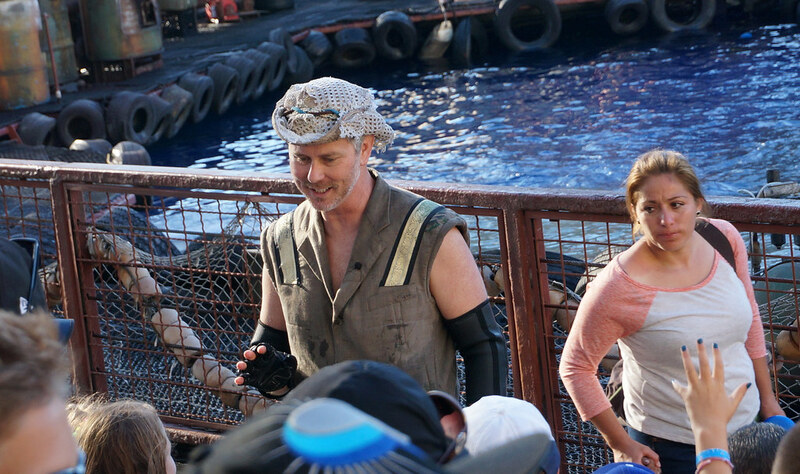 In fact, holistically speaking, this iteration of WaterWorld effectively reintroduces a completely revised show – sharing only vague references to its original form that was operating just a few months back. In short, these are substantial changes, and only fundamental plot elements remain the same. Now, in order to understand the reasoning behind these changes, one must first understand the progression of WaterWorld as a show within the context of Universal Parks and Resorts. 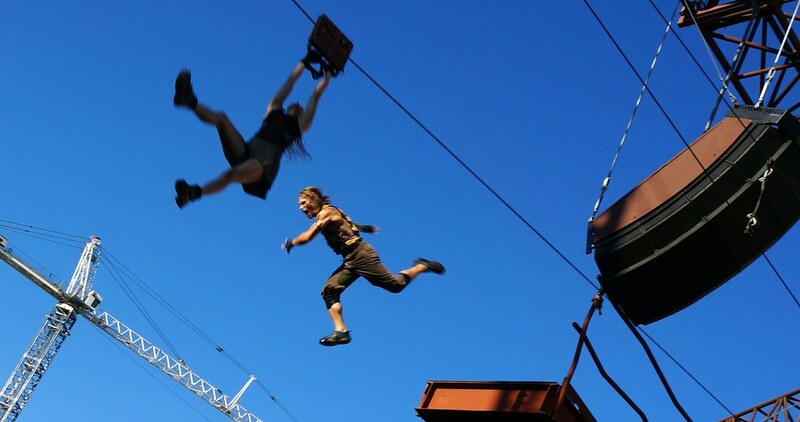 Debuting in 1995 as Universal’s biggest stunt show to date, the success of WaterWorld in Universal Studios Hollywood prompted larger copies at both Universal Studios Japan in 2001 and Universal Studios Singapore in 2010. With each iterative copy, changes were made in the name of safety and efficiency (Singapore and Japan’s atoll points to the center of the arena rather than towards the explosive fuel tank), coupled with the occasional plot tweaks here and there to cover gaping plot holes (given the open gates, why couldn’t the Mariner and Helen simply flee?). 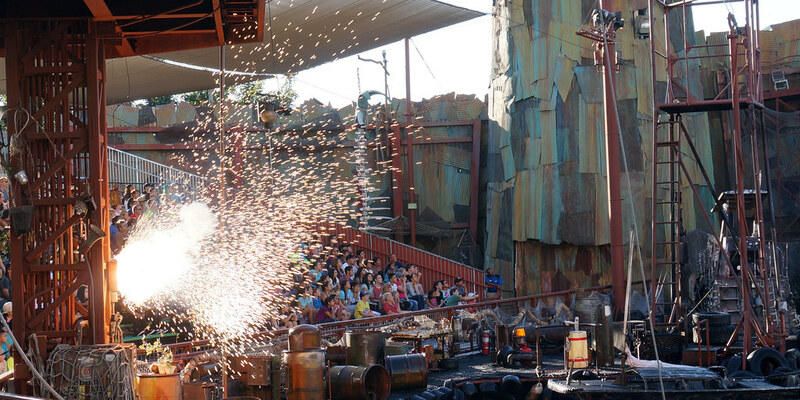 With Action Horizons’ takeover of the show late last year, it only made sense that Singapore (which is also operated by the same company) and Japan’s version of WaterWorld would eventually make its debut back home. So in a rather interesting twist of fate, Hollywood switched from having the first iteration of the WaterWorld format – which, in many respects, can be seen as the most rudimentary of the three – to having the latest, most refined revision compared to its international peers. So while certain elements remain the same (namely, the direction of the atoll), substantive changes have also been introduced throughout the set – bringing it more in line with its international peers. With all this in mind, how do the changes pan out? Perhaps more importantly, do they ultimately work? 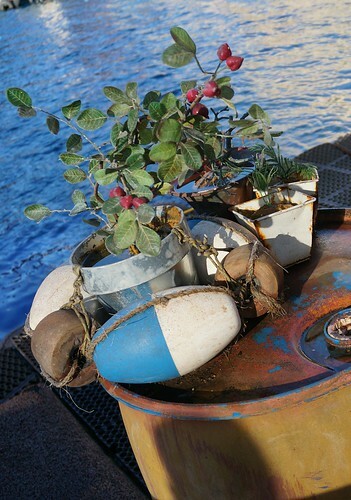 Alongside the usual touch of paint, four substantial changes have been introduced to the WaterWorld set. While the primary atoll structure remains largely unchanged, the second floor of the main tower (photo 1) has been given additional clearance to accommodate a new fight scene between the Mariner and a smoker. In similar fashion, modifications have also been introduced to the right gate allowing an additional high dive (photo 2) alongside an extra dive scene to the right of section two (photo 3). Finally, with the introduction of additional stunts, Action Horizons was also finally able to take advantage of its new sound system, localizing dialogue, gunshots, and effects to a greater extant than it ever having done so before, thereby softening the removal of most live gunfire during. The new sound system and processing also allowed the creative team to create a revised soundfield, creating an experience that completely engulfs the audience. Photo one: additional clearance has been introduced to the second story of the main atoll, accommodating the fight sequence between the Mariner and a smoker. Photo two: an additional high dive has been introduced to the right gate, near section three. Photo three: a smoker attempts to chase after Helen, landing in section two. Note the modified ledge. As you could probably imagine, many of these additions have attempted to bring show elements closer to the audience, though other changes were introduced to accommodate the new plot (and in some cases, a picky neighborhood). Speaking of the plot, what’s changed? Now, rather than attempt to summarize the old narrative in an effort to conduct a painful exercise of compare and contrast, I’m going to assume that you’re at least somewhat familiar with the old plot. If you’re not familiar, we have a video that’s available online for your convenience of the first iteration o the show. With that out of the way (did you watch the video yet? ), let’s move on to some of the major plot differences between the two versions. From a macro point of view, WaterWorld’s fundamental plot remains unchanged. The smokers still follow Helen into the atoll, and the Mariner still manages to defeat the Deacon’s gang of smokers on an individual basis. It’s a stunning feat on the part of the Mariner, and it embodies the classic super-human heroic feat that permeates every Hollywood action flick. However, taking a broad perspective doesn’t really signify the amount of changes that have been introduced. 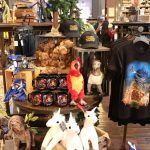 While casual observers may not admittedly notice much of a change, fans and repeat visitors (such as readers of this site) will automatically take note of the show’s new elements. First and foremost, let’s start with the dramatic: the seaplane sequence has been moved from act two to act three – summoned by a final fight sequence between the Deacon and Mariner atop the atoll. Instead of the Mariner and the remainder of the Deacon’s crew reportedly leaping to their death in a spectacular four-person dive, a final fight sequence emerges between a smoker (who, interestingly enough, has a name – Chuck) and the Mariner – both of whom are eliminated in a second story fall. Only until the Mariner and the Deacon meet again in the third act will the plane be summoned through an accidental shot originally intended to destroy Helen’s boat. 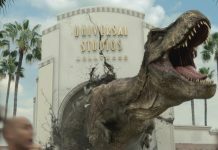 While long-time fans of the show might find this shift jarring (I found myself utterly confused during my first visit to Universal Studios Japan in 2008), repeated showings coupled with an open mind might help make the transition easier to follow. Indeed, it seems that Action Horizons may have attempted to emphasize the fact that there is in fact a plane hovering above the atoll versus the somewhat puzzling out-of-the-blue entrance reminiscent the original show (on paper, the script has the Deacon accidently hitting the plane after the water tower sequence, though its realized effect makes the distinction less clear). Additionally, with this new iteration, we now have the character of Sage, who is the third actor to have a live microphone alongside Helen and the Deacon. With WaterWorld 2.0 comes Sage, a new live-microphoned actor acting as the leader of the atoll. Introduced as a member of the atoll, Sage’s backstory rests on his leadership of the community. In this narrative, audience members are really refugees settling into their new homes as the existing crew – composed of four atollers – attempt to guide and navigate the incoming inhabitants into organized blocs. While Sage is really the combination of multiple characters into one (the atoller who doubles as the Deacon’s fire diver alongside the atoller who acts as the Deacon’s henchmen in the second act), the addition of live dialogue can only serve advantageous effects to the sequence of the show. Instead of Helen seemingly having to organize the smokers’ fight sequence on her own (after all, she just returned), we now have Sage dictating the crew – introducing more inlets for scripted – and in many instances, revised – dialogue from the remainder of the cast. 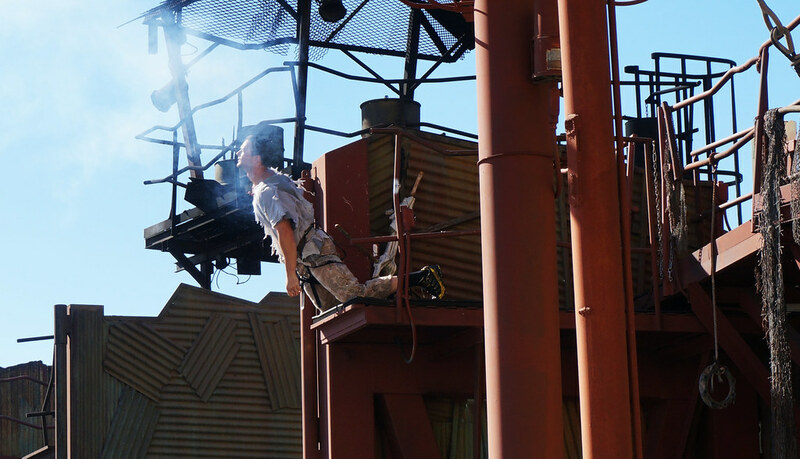 Indeed, the introduction of Sage allows for the addition of more scripted stunts. 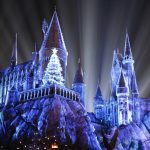 Instead of having the majority of atollers seemingly run off the stage to redress for their secondary roles, more cast members now have a proper exit involving a stunt of some kind – taking advantage of the entire cast and utilizing additional aspects of the set. As a result, we now have an exit involving the right gate alongside Sage’s exit in the toxic tank, giving the show more closure elements than it ever had before. 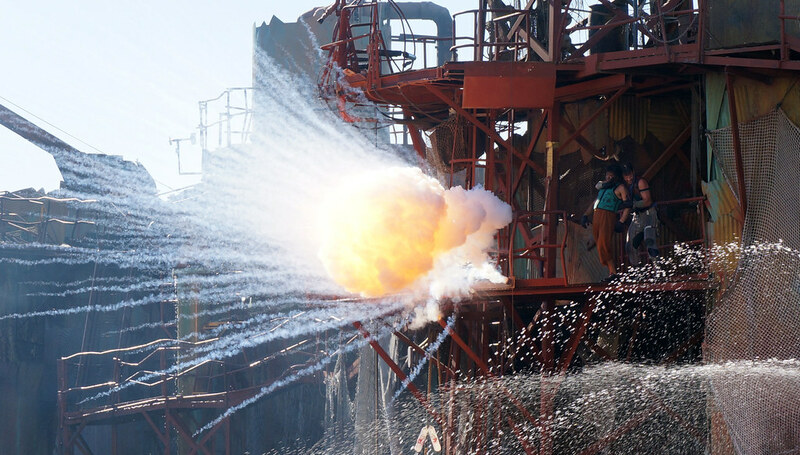 The result of a misfired blast from the Deacon’s bazooka during act three – a new effect introduced by WaterWorld 2.0. WaterWorld’s revised finale, with additional effects originating from the center island. While this results in a more cohesive plot, it also allows the new narrative to pack in as many sequences as possible – with the refined sequence featuring Helen and the Deacon’s henchmen as a primary example. 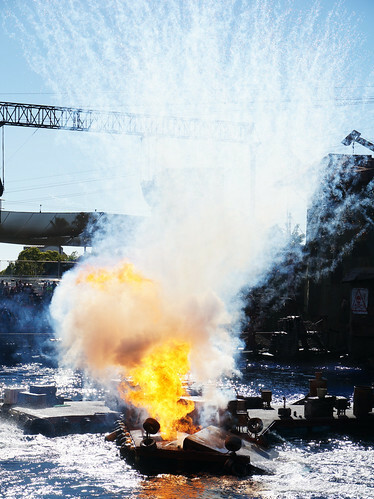 Following the theme of additional effects, more pyrotechnics have been placed in the center island, and smaller effects have been introduced in and around the theater – with all of the theater’s effects going off simultaneously during the show’s finale. In short, did these modifications – both in plot and in structure – manage to enhance the show? In many respects, yes. While critics still contend that there are still too many sequences occuring at once (a criticism which also applies to the old format), the basic formula surrounding WaterWorld’s success remains the same – a relatively strong stunt show driven by an easy-to-follow narrative that surrounds the audience with continual action. What Action Horizons essentially did was refine and polish an otherwise old operation, reevaluating dialogue, modifying fight sequences and tightening the lid on what had become a loose plot. Indeed, after nineteen years, certain sequences within the show were beginning to show their age as actors began ad-libbing certain sequences into the show’s overall premise. 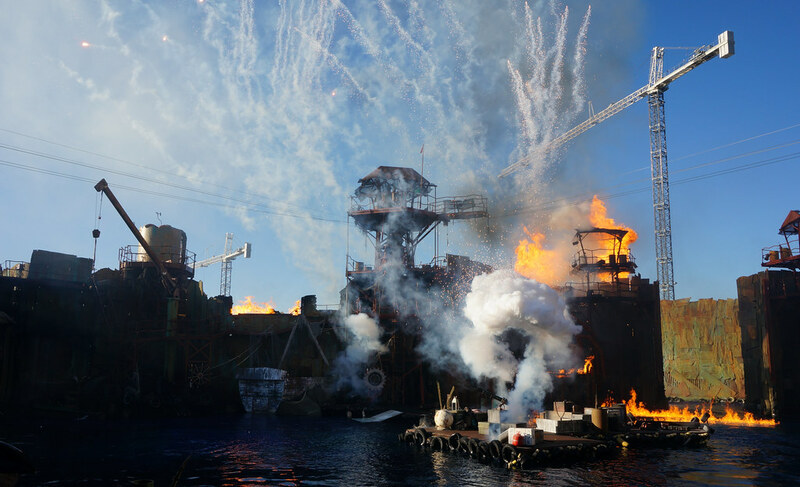 While expected given its sheer age, WaterWorld’s creative adjustment has allowed the show to regain some of its edge. So while die-hard fans may still shrug at the reworked seaplane sequence, many fans – I’m guessing – will welcome the rejuvenated show. 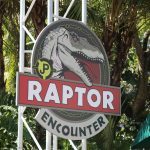 After all, it’s not like Universal to breathe new life into an old attraction without scrapping it altogether. In fact, I think it’s a complete rarity in Hollywood – making this adjustment such a refreshing change. Jon Fu is the editor-in-chief of Inside Universal. Jon currently resides in Santa Cruz, California. 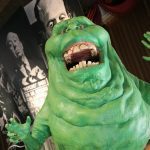 You may reach him at jon@insideuniversal.net.